The driving of the MDX is fully luxury from start to finish. The improved and highly tuned suspension easily rejects any and all road defects keeping the occupants in their seats with minimal road feel at all. The steering is super responsive to corner and handle any road with an ease and smoothness expected of a luxury vehicle. The all-wheel drive version add a major component to the control of this vehicle with the use of the Super-Handling All-Wheel Drive (SH-AWD) only features on the Acura line of vehicles and strong enough to give Subaru a run for its money. With the use of a generous amount of insulation and a well-designed noise cancellation system the outside noises are left outside the vehicle offering a getaway for anyone riding in the MDX. Only one engine is offered for this SUV in the form of a 3.5-liter V6 engine that comes in with 290 horsepower and 267 lb.-ft. of torque which is plenty of power to handle the jobs that can be thrown its way. This well-engineered V6 adds the benefit of Variable Cylinder Management that allows the SUV to be powered by only three cylinders when six are not needed saving fuel and adding to the overall fuel efficiency of the SUV. This allows the MDX to qualify as the most fuel efficient SUV that is not powered by a hybrid engine in this category, giving one more reason to purchase an MDX. Mated up with a well-designed six-speed automatic transmission this SUV can achieve a fuel economy of 20 city/28 hwy mpg for the front-wheel drive model and 18 city/27 hwy mpg for the SH-AWD version. The fuel needed to power this excellent SUV is premium gasoline so there is some trade-off for the fuel efficiency. The cabin of the MDX features refined luxury with an emphasis on comfort and intuitive use. The controls are all in place where drivers need them most with the most used closest to or on the steering wheel. The materials used throughout the cabin are of the highest possible quality giving each occupant a plush and comfortable seat to ride in. Add faux wood trim and a few metal accents and the MDX shows off its luxury styling with ease. Two LCD displays are positioned smartly in the dashboard to offers control of most of the functions needed. The second row seat folds and slides forward to allow easier third row access than some of the competitors making entry much easier. 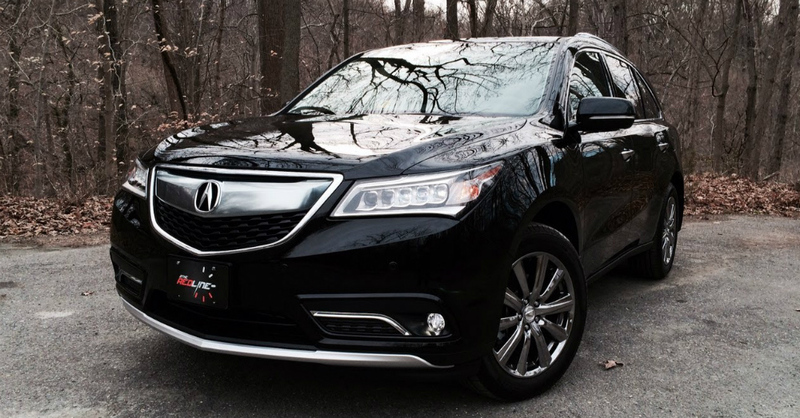 ON the outside the MDX continues to add beauty and style to the equation. The multi-projector “Jewel Eye” headlights accent the front face of the vehicle that also sports a smiling spit grill. The curves and lines of the vehicle add to the enticement of the high stance and excellent wheelbase. With a longer, but narrower and shorter size than in years past this MDX is more maneuverable than some of the competition that comes in as a lumbering bunch. The rear adds interest with LED taillights and a rear spoiler that allows for a look of finish and wind resistance to the SUV. The wheels are large mag-inspired spoked wheels that offer a touch of menace to an otherwise tame luxury vehicle. Standard features for the MDX come in one trim level but have four progressive options, which sounds like a fancy way to say four trim levels. These features include LED headlights, keyless access, keyless starting, a rearview camera, leather upholstery, tri-zone climate control, heated front seats, a power lift gate, an eight-speaker audio system with Aha radio and Pandora connectivity, seven airbags, the ACE reinforced body structure and trailer stability control for SH-AWD models. With all these features coming standard there is no doubt this vehicle is truly a luxury SUV that has plenty of fans coming back for a second helping. The optional features for the MDX are loaded into packages including the Technology Package with offers a navigation system, 19-inch alloy wheels, rain sensing wipers and a forward collision warning system. The Advanced Package includes a rear seat entertainment system with a 16.2-inch split-screen display, a 12-speaker ELS premium audio system, an adaptive cruise control, and Lane Keep Assistance. Putting these packages into the MDX allows this already luxurious vehicle to become on that really reaches high and competes with character, safety, control and entertainment value. The 2015 Acura MDX starts out at a reasonable price for a luxury SUV at just over $43,000. Adding the two packages to the mix will add $6,275 to the price and the top of the line model with all the options possible will come in around $58,000. Even at these prices the MDX is well worth the money when shopping in the luxury SUV marketplace by offering third row seating, a size that is easy to maneuver, and a host of great features to love and enjoy for many years, or at least until it’s time to buy another MDX.